How has everyone's Christmas been? It's the last few days of 2014 and I'm actually really excited for the new year and to see what it'll bring. I had a really enjoyable 2014 and I'm hoping next year will follow suit. One of the funnest parts of the Christmas period is that it's party season. There's plenty of opportunity to get dressed up and this is definitely the time to incorporate glitter and glamour into your style. I left getting my Christmas nails done until the very last moment; I was the last person in the salon on Christmas Eve. I don't regret it as I had gorgeous fresh nails on Christmas Day and they still feel sparkly and new which is such a good feeling, I always wish it could last forever. Walking into the salon I had no idea what I wanted doing to my nails, I just knew I wanted them to be pointed and festive; I wanted glitter somewhere or another. The lady who did my nails actually suggested the colour and glitter tips to me, and I'm glad she did as I'm pretty much in love with these Christmas nails. I'm not sure of any specific names of colours but the base coat is a red OPI polish with a slight glitter element to it whilst the sparkly tips are a heavy glitter silver which was applied using a small flat sponge to distribute it lightly and evenly. I'm dead chuffed with the end result, these are such gorgeously Christmassy nails that are still perfect throughout party season. What have your nails looked like over Christmas? Love your nails! They have given me inspiration for a new years outfit! 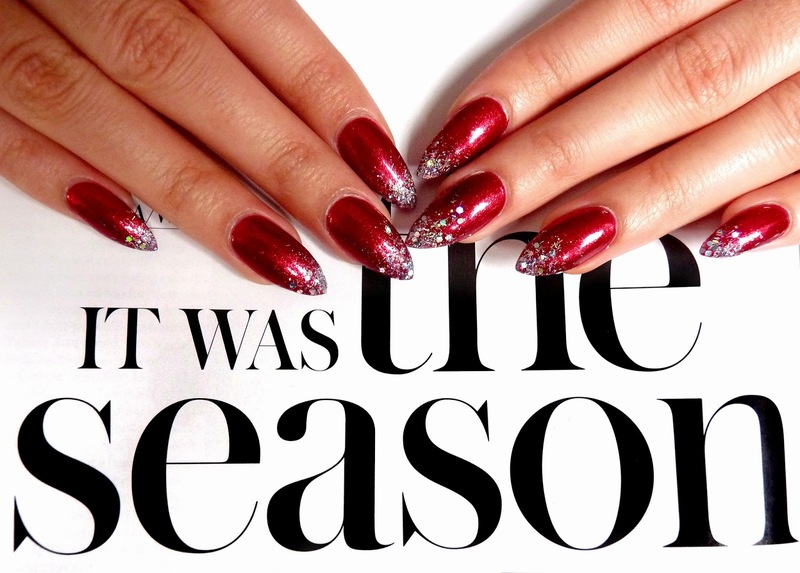 Love the nails... so festive! My nails have looks terrible for the past few months, I just have not had time to do anything to them at all but I love yours!